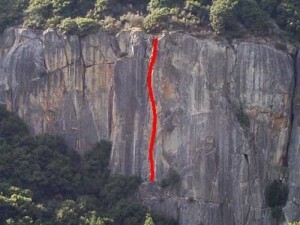 This route is sustained at 5.9. The first pitch features a mixture of hand and chimney moves that provide a preview of challenges to come. The second pitch has the two characteristics of a classic Yosemite crack pitch: burly and sustained. This pitch involves a variety of strenuous stems and jams with wide protection. The last pitch is rarely climbed. Which SuperTopo guidebooks include a topo for Meat Grinder?